"A sweet, yummy, muffin! Try it with real maple syrup if you get a chance but any maple flavor syrup will do! You may also add 1/2 cup of chopped walnuts to this recipe if you wish." In a large bowl, cream together butter and brown sugar. Beat in maple syrup, egg, cream and vanilla. In a separate bowl, stir together flour, oats, baking powder, baking soda, salt and cinnamon. Stir flour mixture into egg mixture just long enough to incorporate. 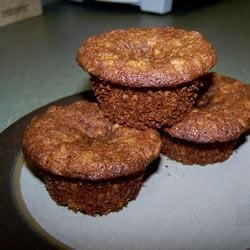 Spoon batter into prepared muffin cups. Bake in preheated oven for 15 to 20 minutes. Remove from pans and place on a wire rack to cool before serving. A berry tasty way to start your day! First let me say that this recipe is an inflated cookie. It is sweet and has a crunchy top. It does fall completely apart. The flavor is nice. It's just not what I'm looking for.